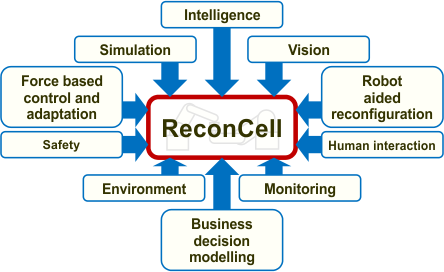 ReconCell proposes to develop a widely autonomous robotic workcell that will allow very short, self-adaptable and affordable changeovers under the conditions demanded and based on end-user needs. This will be achieved with the minimum use of additional resources over the system’s lifetime. ReconCell aims at designing and implementing a new kind of an autonomous robot workcell, which will be attractive not only for large production lines but also for few-of-a-kind production, which often takes place in SMEs. The proposed workcell is based on novel ICT technologies for programming, monitoring and executing assembly operations in an autonomous way. It can be nearly automatically reconfigured to execute new assembly tasks efficiently, precisely, and economically with a minimum amount of human intervention. This approach is backed up by a rigorous business-case analysis, which shows that the ReconCell system is economically viable also for SMEs. Production of plastic and sheet metal parts will be considered for demonstration purposes. A simulated and real pilot demonstration will be implemented in the laboratory conditions and in the real SME-like environment (Technology Readiness Level 6). On the business side, the consortium’s overall commercial ambition and vision is to bring the ReconCell robot system to the market. The strategy is to develop and demonstrate its usage in real-life environments at client. This includes preparation of the post-project commercial phase with focus on development of a business plan as well as involving investors in setting up a commercially sustainable enterprise from which the ReconCell subsequently can be implemented and scaled as a new product and business for the world market with a product and distribution philosophy that enables a global uptake of the technology / production companies. All partners agree to grant free of charge all necessary IPR, licenses, etc. that will be developed in the project and are required to fully support and realise this ambition. Based on an analogy to the App business eco-system and Amazon’s “long-tail” market model a business and entrepreneurial developer network in ReconCell will drive a “Web-Shop” with App-like skills and tools for automating branch-, materials-, process- or in other ways specific assembly processes that will ensure an ongoing development and spreading of ReconCell technologies. 3D vision system that enables monitoring, recognition, and pose estimation for fast re-positioning of workpieces. Smart affordable reconfigurable workcell design that includes passively reconfigurable fixtures to enable fast adaptation of the robotic assembly workcell with minimum human intervention, but still leaving the possibility of human interaction on demand. Cooperative autonomous robots that can speed up the work, jump-in in the case of problems, replace something, or simply sequentially execute assembly operations. A two robot arm solution will be used in ReconCell. Force-based control and adaptation capabilities to relax the requirements with respect to inaccuracies in positioning or tolerance-deviations during assembly. Effective robot programming technologies and innovative strategies and concepts to enable fast acquisition of new assembly skills and skill libraries. Online monitoring capabilities to collect KPIs (Key Performance Indicators) as well as to support error recovery, to allow for exception handling, and to provide support-actions where the second robot helps the first to recover the task "in another way”. The monitoring functionality will also enable remote servicing. Robot assembly cell simulation which should be associated both with the design of the product and simulation of robot assembly. Business modelling techniques to support setting-up of a new production process. Here the objective is to predict whether it is profitable to assemble a new product in the proposed workcell already before implementing the complete process in a real workcell.